Stoveman integrated water tank is designed for heating water in conditions where no stationary water supplies are available and the water used in sauna comes from a river, a lake or a well. 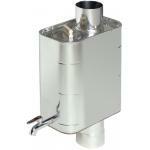 The water tank is compatible with all wood burning sauna heaters that have a 115 mm smoke pipe. The water tank is attached between the pipe coming from the heater and the chimney pipe that continues towards the roof. 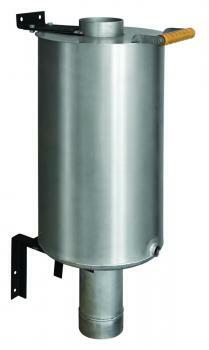 The water tank is 320mm diameter cylindrical container with a lid. The Stoveman integrated water tank contains 38 litres of water. The water tank is equipped with a tube (with 3/4 internal thread) with the possibility to mount a tap. 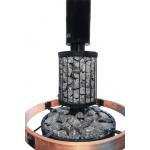 The product is equipped with adjustable brackets, making the emplacement of the product easy and simple. 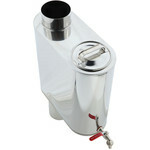 The water tank is made of 1,5mm stainless steel. The chimney pipe inside the water tank that is heating the water is made of 2mm special acid- and heat resistant stainless steel. Incrust may occur on the interior of the tank.